Though the young Chinese pianist has been dubbed “Bang Bang’ by critics for his eccentric flamboyance and showy virtuosity, apparently Lang Lang is a hot commodity, hotter now than ever. But for all that, I guess he’s temperamental and insecure too. He asked the prestigious label Deutsche Grammophon to drop his fellow Chinese pianist – Yundi Li (below) – and DG quickly obliged, even though I find Li to be much the superior pianist and musician. But then I usually favored Rubinstein over Horowitz too. Anyway, when it comes to the precarious business of classical music these days, loyalty only goes so far on either side of the commercial equation. Sony Records apparently went shopping for Lang Lang with an unlimited black check in hand. And the quest was successful. 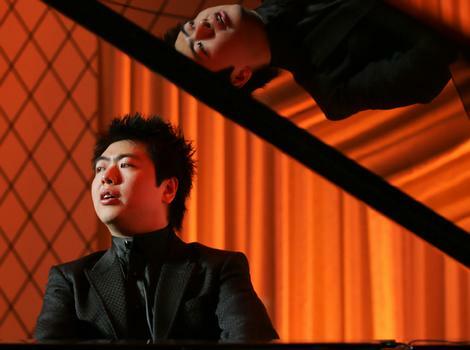 For the sum of $3 million, Lang-Lang is now – a drum roll, please — a SONY artist. And although Yundi Li has apparently found home at Angel-EMI, I hope that DG will approach him again and ask him to come home. Funny, but all the action in pianists now seems Asia-related. There’s Lang-Lang and Yundi Li; Yuja Wang and Sa Chen; the Van Cliburn competition winners Nobuyuki Tsuji, Yeol Eum Son and Haochen Zhang; and the Japanese-German Alice Sara Ott, who tops them all so far in my book. Any speculation about why that is and what it means for the West? What do you think of Lang-Lang? Do you like or dislike his playing? What are his best and worst recordings? OK, back to Bach and Beethoven. As noted in Musical America, SONY bought in Lang Lang what they expect will be an incredibly lucrative pipeline into the Chinese music-buying market (if the music pirates don’t make off with the money). I’ve heard him both in concert and on disk. It’s never about the music. It’s always about Lang Lang. Perhaps he’ll sign a deal and start wearing Nikes on stage.